Resurfacing concrete is one of the best methods of giving a worn out and eyesore concrete a makeover. Other techniques include the application of overlays and staining but we will focus on concrete resurfacing. One of our company’s goals is to remove imperfection from our clients’ concrete surfaces. We can be reached via ​916-571-0908 any time of the day. Over time, concrete floors suffer discoloration, stains, and unsightly cracks. These blemishes have to be removed to restore the ideal look of the surface. We provide a number of repair options including but not limited to resurfacing on driveways, patios, interior floors, pool decks, walkways, and so on. The best thing about resurfacing is that it helps you save money you would otherwise spend on a full replacement. You will also contribute to the conservation of the environment by avoiding dumping of the old materials. We resurface concrete through application of polymer-modified overlays which come in a vast spectrum of colors and patterns. We resurface concrete which is still in good condition or that which requires a simple facelift. After resurfacing, we may stain, engrave, or stencil the repaired concrete depending on your preferences. It is a special type of concrete with bonding elements which can overcome any installation challenge. It is different from the regular concrete hence a bit expensive. Typical concrete mix has no bonding elements and if applied to an old surface, it cannot bond well and will begin to crumble sooner than you imagine. A concrete resurfacing contractor levels itself and doesn’t need to be worked to form a smooth surface. It is very easy to pour and spread and the contractor’s main concern is to see that it has covered the entire space that needs repair. Trowelling is not necessary as in the case of installing new concrete. The main color, ole gray, may be tinted with concrete-specific colorants to give desirable hues. Note that matching colors of old and new concrete is quite hard but with an experienced contractor, nothing is impossible. Find out what else we have in store for you by calling 916-571-0908 today. 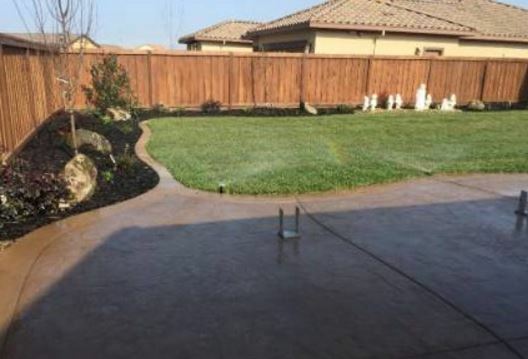 Contact 916-571-0908 now for free quotes and estimates.